To help you manage your instances, images, and other Amazon EC2 resources, you can optionally assign your own metadata to each resource in the form of tags. This topic describes tags and shows you how to create them. Tags enable you to categorize your AWS resources in different ways, for example, by purpose, owner, or environment. This is useful when you have many resources of the same type—you can quickly identify a specific resource based on the tags you've assigned to it. For example, you could define a set of tags for your account's Amazon EC2 instances that helps you track each instance's owner and stack level. The following diagram illustrates how tagging works. 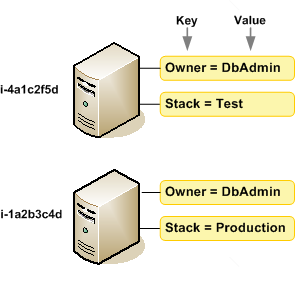 In this example, you've assigned two tags to each of your instances—one tag with the key Owner and another with the key Stack. Each tag also has an associated value. Tags don't have any semantic meaning to Amazon EC2 and are interpreted strictly as a string of characters. Also, tags are not automatically assigned to your resources. You can edit tag keys and values, and you can remove tags from a resource at any time. You can set the value of a tag to an empty string, but you can't set the value of a tag to null. If you add a tag that has the same key as an existing tag on that resource, the new value overwrites the old value. If you delete a resource, any tags for the resource are also deleted. You can work with tags using the AWS Management Console, the AWS CLI, and the Amazon EC2 API. If you're using AWS Identity and Access Management (IAM), you can control which users in your AWS account have permission to create, edit, or delete tags. For more information, see Controlling Access to Amazon EC2 Resources. You can tag most Amazon EC2 resources that already exist in your account. The table below lists the resources that support tagging. If you're using the Amazon EC2 console, you can apply tags to resources by using the Tags tab on the relevant resource screen, or you can use the Tags screen. Some resource screens enable you to specify tags for a resource when you create the resource; for example, a tag with a key of Name and a value that you specify. In most cases, the console applies the tags immediately after the resource is created (rather than during resource creation). The console may organize resources according to the Name tag, but this tag doesn't have any semantic meaning to the Amazon EC2 service. If you're using the Amazon EC2 API, the AWS CLI, or an AWS SDK, you can use the CreateTags EC2 API action to apply tags to existing resources. Additionally, some resource-creating actions enable you to specify tags for a resource when the resource is created. If tags cannot be applied during resource creation, we roll back the resource creation process. This ensures that resources are either created with tags or not created at all, and that no resources are left untagged at any time. By tagging resources at the time of creation, you can eliminate the need to run custom tagging scripts after resource creation. The following table describes the Amazon EC2 resources that can be tagged, and the resources that can be tagged on creation using the Amazon EC2 API, the AWS CLI, or an AWS SDK. You can tag instances and volumes on creation using the Amazon EC2 Launch Instances wizard in the Amazon EC2 console. You can tag your EBS volumes on creation using the Volumes screen, or EBS snapshots using the Snapshots screen. Alternatively, use the resource-creating Amazon EC2 APIs (for example, RunInstances) to apply tags when creating your resource. You can apply tag-based resource-level permissions in your IAM policies to the Amazon EC2 API actions that support tagging on creation to implement granular control over the users and groups that can tag resources on creation. Your resources are properly secured from creation—tags are applied immediately to your resources, therefore any tag-based resource-level permissions controlling the use of resources are immediately effective. Your resources can be tracked and reported on more accurately. You can enforce the use of tagging on new resources, and control which tag keys and values are set on your resources. You can also apply resource-level permissions to the CreateTags and DeleteTags Amazon EC2 API actions in your IAM policies to control which tag keys and values are set on your existing resources. For more information, see Supported Resource-Level Permissions for Amazon EC2 API Actions and Example Policies for Working with the AWS CLI or an AWS SDK. For more information about tagging your resources for billing, see Using Cost Allocation Tags in the AWS Billing and Cost Management User Guide. Although EC2 allows for any character in its tags, other services may be more restrictive. Generally allowed characters are: letters, numbers, and spaces representable in UTF-8, and the following characters: + - = . _ : / @. These characters may not be allowed by more restrictive services. You can't terminate, stop, or delete a resource based solely on its tags; you must specify the resource identifier. For example, to delete snapshots that you tagged with a tag key called DeleteMe, you must use the DeleteSnapshots action with the resource identifiers of the snapshots, such as snap-1234567890abcdef0. You can tag public or shared resources, but the tags you assign are available only to your AWS account and not to the other accounts sharing the resource. You can't tag all resources. For more information, see Tagging Support for Amazon EC2 Resources. You can use tags to organize your AWS bill to reflect your own cost structure. To do this, sign up to get your AWS account bill with tag key values included. For more information about setting up a cost allocation report with tags, see The Monthly Cost Allocation Report in AWS Billing and Cost Management User Guide. To see the cost of your combined resources, you can organize your billing information based on resources that have the same tag key values. For example, you can tag several resources with a specific application name, and then organize your billing information to see the total cost of that application across several services. For more information, see Using Cost Allocation Tags in the AWS Billing and Cost Management User Guide. Cost allocation tags can indicate which resources are contributing to costs, but deleting or deactivating resources doesn't always reduce costs. For example, snapshot data that is referenced by another snapshot is preserved, even if the snapshot that contains the original data is deleted. For more information, see Amazon Elastic Block Store Volumes and Snapshots in the AWS Billing and Cost Management User Guide. Elastic IP addresses that are tagged do not appear on your cost allocation report. Using the Amazon EC2 console, you can see which tags are in use across all of your Amazon EC2 resources in the same region. You can view tags by resource and by resource type, and you can also view how many items of each resource type are associated with a specified tag. You can also use the Amazon EC2 console to apply or remove tags from one or more resources at a time. For more information about using filters when listing your resources, see Listing and Filtering Your Resources. For ease of use and best results, use Tag Editor in the AWS Management Console, which provides a central, unified way to create and manage your tags. For more information, see Working with Tag Editor in Getting Started with the AWS Management Console. You can display tags in two different ways in the Amazon EC2 console. You can display the tags for an individual resource or for all resources. When you select a resource-specific page in the Amazon EC2 console, it displays a list of those resources. For example, if you select Instances from the navigation pane, the console displays a list of Amazon EC2 instances. When you select a resource from one of these lists (for example, an instance), if the resource supports tags, you can view and manage its tags. On most resource pages, you can view the tags in the Tags tab on the details pane. You can add a column to the resource list that displays all values for tags with the same key. This column enables you to sort and filter the resource list by the tag. There are two ways to add a new column to the resource list to display your tags. On the Tags tab, select Show Column. A new column is added to the console. Choose the Show/Hide Columns gear-shaped icon, and in the Show/Hide Columns dialog box, select the tag key under Your Tag Keys. You can display tags across all resources by selecting Tags from the navigation pane in the Amazon EC2 console. The following image shows the Tags pane, which lists all tags in use by resource type. You can manage tags for an individual resource directly from the resource's page. From the navigation bar, select the region that meets your needs. This choice is important because some Amazon EC2 resources can be shared between regions, while others can't. For more information, see Resource Locations. In the navigation pane, select a resource type (for example, Instances). Select the resource from the resource list and choose Tags, Add/Edit Tags. In the Add/Edit Tags dialog box, specify the key and value for each tag, and then choose Save. In the navigation pane, choose a resource type (for example, Instances). Select the resource from the resource list and choose Tags. Choose Add/Edit Tags, select the Delete icon for the tag, and choose Save. At the top of the content pane, choose Manage Tags. For Filter, select the type of resource (for example, instances) to which to add tags. In the resources list, select the check box next to each resource to which to add tags. Under Add Tag, for Key and Value, type the tag key and values, and then choose Add Tag. If you add a new tag with the same tag key as an existing tag, the new tag overwrites the existing tag. In the navigation pane, choose Tags, Manage Tags. To view the tags in use, select the Show/Hide Columns gear-shaped icon, and in the Show/Hide Columns dialog box, select the tag keys to view and choose Close. For Filter, select the type of resource (for example, instances) from which to remove tags. In the resource list, select the check box next to each resource from which to remove tags. Under Remove Tag, for Key, type the tag's name and choose Remove Tag. From the navigation bar, select the region for the instance. This choice is important because some Amazon EC2 resources can be shared between regions, while others can't. Select the region that meets your needs. For more information, see Resource Locations. The Choose an Amazon Machine Image (AMI) page displays a list of basic configurations called Amazon Machine Images (AMIs). Select the AMI to use and choose Select. For more information about selecting an AMI, see Finding a Linux AMI. On the Configure Instance Details page, configure the instance settings as necessary, and then choose Next: Add Storage. On the Add Storage page, you can specify additional storage volumes for your instance. Choose Next: Add Tags when done. On the Add Tags page, specify tags for the instance, the volumes, or both. Choose Add another tag to add more than one tag to your instance. Choose Next: Configure Security Group when you are done. On the Configure Security Group page, you can choose from an existing security group that you own, or let the wizard create a new security group for you. Choose Review and Launch when you are done. Review your settings. When you're satisfied with your selections, choose Launch. Select an existing key pair or create a new one, select the acknowledgment check box, and then choose Launch Instances. You can filter your list of resources based on one or more tag keys and tag values. In the details pane, choose Tags. Locate the tag in the list and choose Show Column. Choose the filter icon in the top right corner of the column for the tag to display the filter list. Select the tag values, and then choose Apply Filter to filter the results list. For more information about filters, see Listing and Filtering Your Resources. Describe one or more tags. You can also filter a list of resources according to their tags. The following examples demonstrate how to filter your instances using tags with the describe-instances command. The way you enter JSON-formatted parameters on the command line differs depending on your operating system. Linux, macOS, or Unix and Windows PowerShell use the single quote (') to enclose the JSON data structure. Omit the single quotes when using the commands with the Windows command line. For more information, see Specifying Parameter Values for the AWS Command Line Interface. The following command describes the instances with a Stack tag, regardless of the value of the tag. The following command describes the instances with the tag Stack=production. The following command describes the instances with a tag with the value production, regardless of the tag key. Launch one or more instances. The following command launches an instance and applies a tag with a key of webserver and value of production to the instance. The command also applies a tag with a key of cost-center and a value of cc123 to any EBS volume that's created (in this case, the root volume). You can apply the same tag keys and values to both instances and volumes during launch. The following command launches an instance and applies a tag with a key of cost-center and a value of cc123 to both the instance and any EBS volume that's created. The following command creates a volume and applies two tags: purpose = production, and cost-center = cc123. This example adds the tag [Group]=test to an instance. The square brackets ([ and ]) are special characters, and must be escaped with a backslash (\). If you are using Windows PowerShell, break out the characters with a backslash (\), surround them with double quotes ("), and then surround the entire key and value structure with single quotes ('). If you are using Linux or OS X, enclose the entire key and value structure with single quotes ('), and then enclose the element with the special character with double quotes (").